Georgians like to eat and drink. As always, they were out partying when God had just made the earth and was distributing the land, so by the time they came back nothing was left. “But we have been drinking to your health”, they pleaded, and God gave in and let them have the heavenly bit of land He had reserved for Himself. And indeed the Georgians never lost their love for partying and drinking that the legend evokes. Most families grow grapes in their garden or on the rooftops and make their own wine. “To peace!” “To women!” “To democracy!” With each toast, our host Suliko emptied another glass, drinking horn, porcelain shoe, or other curiously shaped vessel. Admittedly, his pace of wine consumption required a lot of toasts, but when did we hear someone toast to democracy? Originally a textile designer, but now working on construction sites, Suliko is not among the winners in Georgia’s transition to a market economy. He and his family live in a rickety old house with (cold) running water only in the morning. His wife Mediko spent much of the day cutting up leeks and peppers. “So we can have pickled salad in winter, when we can’t afford vegetables,” she explains. In Tbilisi we passed a political demonstration in front of the parliament. Policemen with rolled-up sleeves stood behind the crowd, casually listening to the speakers. Our first impulse was to change to the other side of the road. Suddenly, we realized how used we had become to arbitrary police controls and repressive militia during our four months of traveling in China and Central Asia. “Previously, it was easier: you could just buy a driving licence.” Sophie has just turned 18 and had to take an exam and a driving test to get hers. Nevertheless, she greatly prefers President Saakashvili to his predecessor, Eduard Shevardnadze under whom corruption blossomed and the economy deteriorated. Michail Saakashvili became president through the so-called rose revolution. After flawed elections in November 2003, Georgian citizens took to the streets. Unarmed, but distributing roses, they forced Shevardnadze to flee the parliament, and eventually Saakashvili convinced him to resign. In January 2004 Saakashvili was elected president with 96.6% of the votes. The political reforms initiated since then have inspired great optimism in Georgia and abroad. 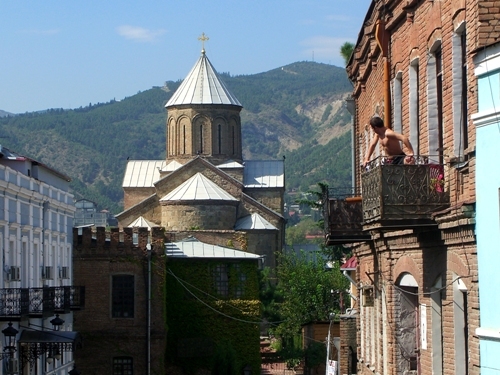 The small part of Georgia we saw was lovely – we bet on Tbilisi as the next Prague –, and the Georgians are extraordinarily friendly and welcoming people, but we both felt even more attracted by the cosmopolitan charm of Baku (although Azerbaijan is ruled by yet another ex-communist father-son dynasty). Situated at the deep-blue Caspian Sea, it feels at the same time oriental, Mediterranean, and Western. Although the majority of the population is Muslim, headscarves are rare. At the beginning of Ramadan, a lot of people were out in the sun eating ice-cream and snacks at the palm tree-fringed sea-front. Some of the plentiful oil money has been used to restore the beautiful houses in the Old Town, and small specialty shops and boutiques invite to stroll around. Where our guidebooks for the Caucasus invoked a region full of crime and corruption, remnants of civil war, and dirty business that we would best rush through, we found the most liberal and inviting places we had seen for months.